The Virginia basketball team raced out to a big lead and then withstood some sloppy play and the resilient effort of Middle Tennessee State to win 74-52 in the Battle 4 Atlantis opening round on Wednesday night. The Cavaliers reached 4-0 on the season. The Hoos led 30-9 in the first 11:30, but saw that lead dwindle late in the first half and drop to as low as eight points early in the second half. A season-high 13 turnovers contributed to some of MTSU’s ability to trim into the deficit, but UVA never trailed and led by double figures for the final 17:55 . While the victory didn’t have metronomic consistency, Virginia coach Tony Bennett said it was important for his team to play through the challenges it presented. 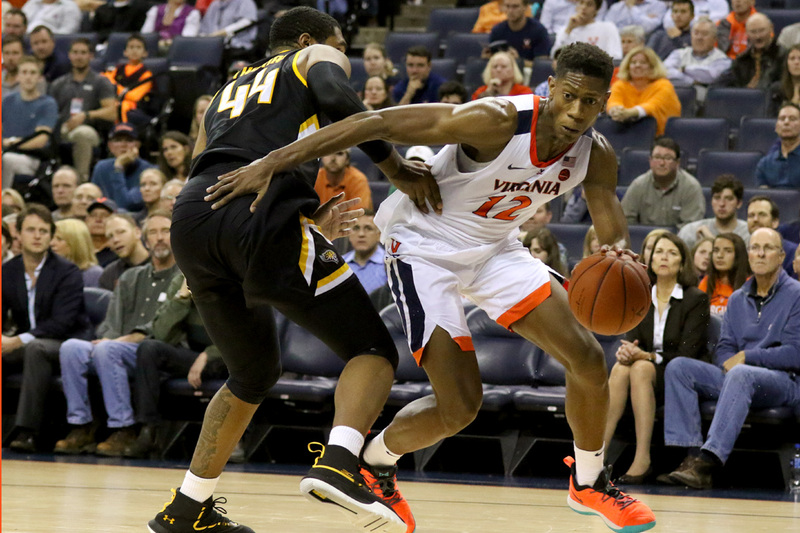 A balanced attack keyed the win against the Blue Raiders in the Bahamas, but Virginia forward De’Andre Hunter put together a quiet back-breaking line to lead the way. Hunter scored 15 points on 5-of-9 shooting and added 8 rebounds, 9 assists, 1 steal, and 1 block. Only 4 turnovers slightly blemished an effort that picked apart Middle Tennessee from all over the floor. Against man defense, Hunter worked in the mid-range and mid-post to create a mix of jumpers, drives, and face-up post moves. Against some rotating zone looks, he stepped outside to hit 3-pointers and then sliced up things from the high post as a passer where many of his assists came from on kickouts and dump-downs. Those passes set up some easy looks for his teammates finding open space away from zone defenders. Among Hunter’s career-high 9 assists were five passes that led 3-pointers, meaning he had helpers on five of the eight made triples in the game. That included all three treys for Kyle Guy, who matched Hunter for game-high honors with 15 points. None were bigger, perhaps, than one early in the second half. MTSU stitched together a quick 5-0 spurt after intermission to cut UVA’s lead to 38-30 at the 18:09 mark and any further fuel for that flurry could have made things interesting in the early minutes of the second half. Instead, Hunter found Guy for a 3-pointer just 14 seconds later that pushed the lead back to double figures and it never dropped below 10 points again. That triple started a 9-0 run, which included a Mamadi Diakite jumper and a Hunter baby hook, to answer the Raiders. Middle Tennessee State kept battling so Virginia didn’t completely run away after that surge, but those critical moments were enough to let the Cavaliers control the outcome the rest of the way. Braxton Key joined Hunter and Guy in double digits with a season-high 13 points of his own. That was part of another game where he showed off how his versatility could be a huge factor for UVA this season. As part of those 13 points, he got to the line for 5 free throws and made them all. Plus, he ended up with 7 rebounds, 2 assists and 2 steals as well. Diakite, Ty Jerome, and Kihei Clark rounded out the balanced scoring. Diakite posted 8 points, while Jerome and Key each had 7. Jerome also added 3 assists. The Cavaliers advance to face Dayton in the event’s semifinals on Thursday at 4 p.m., a quick turn-around following the 9:30 p.m. start time against MTSU. They’ll carry a nation’s best 22-game November winning streak into that matchup.